In case you didn’t notice, BTWB recently updated its app with new notification capabilities. These updates are great for helping us stay on top of logging our workouts as well as notifying you of what today’s workout is. The cool thing is you can even choose what time of day these notifications pop up so it can be set up to tell you what the WOD is in the morning when you’re getting you’re packing your bag for the day, and it can remind you to log your results after the class time you normally attend. See below for details. 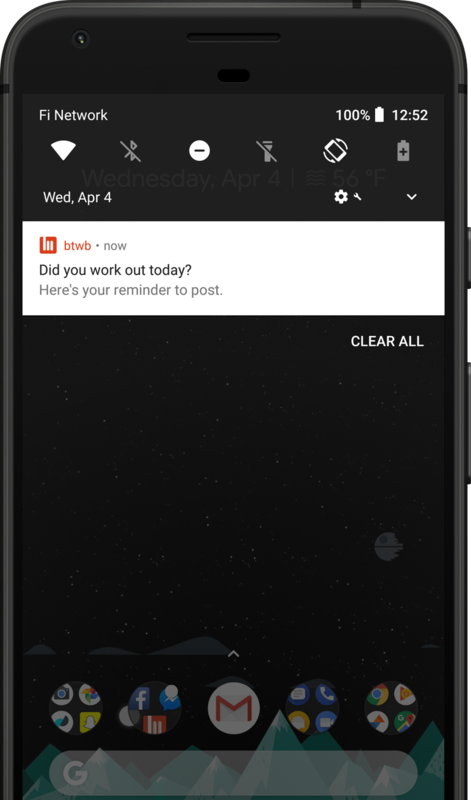 You can now set Push Notifications for the mobile app to show you your workout for the day as well as a reminder to log your workout if you forgot. Tapping on the notification will take you to your Today’s WOD page where you can see everything assigned and log your result if needed. These new notifications are ON by default for any new member who’s joined after the end of February 2018. These notifications will be OFF by default for anyone who joined prior to February 2018. Tap the btwb icon to pull out the side menu. From here, you can choose when and from what tracks your notifications appear for.